Samsung Electronics America has announced that its own 5G-Ready M-MIMO (massive multiple input / multiple output) solutions deployed on the 2.5 GHz TDD-LTE network of Sprint are currently available for commercial service. The Samsung M-MIMO solutions on Sprint network offers enhanced 4G-LTE through-put as well as improved capacity to Sprint customers. This is a welcomed development as it provides Sprint with a smooth upgrade path from 4G to 5G NR (New Radio) equipment on the carrier’s 2.5 GHz spectrum. This latest massive MIMO from the stable of Samsung is intended to facilitate high performance of the next generation of LTE. It is also designed to set up the network of Sprint for the future of 5G. The solution comes with the latest high capacity digital unit and software for MIMO. Earlier in 2018, Sprint had declared its intention to choose Samsung as its massive MIMO provider for the launch of its future 5G mobile network in the United State. This has been widely acclaimed as a crucial milestone for the carrier. The massive MIMO offered by Samsung has the potential to give operators the means to introduce new capacity into their network without necessarily adding new towers or purchase additional spectrum. Samsung MIMO is currently being utilized by Sprint to drastically improve the speeds and capacity of its LTE networks for millions of its customers in the United States, while enhancing network effectiveness through sophisticated beam-forming. According to the Vice President, Networks Division of Samsung Electronics America, Lyle Nyffeler, the MIMO solutions have been engineered to optimize the 4G network while providing a seamless and efficient path to the 5G future. Lyle went further to say that the company is happy to see that its MIMO solutions are in use on the current LTE commercial network of Sprint, which will significantly help customers to experience the total gains of the network innovation. 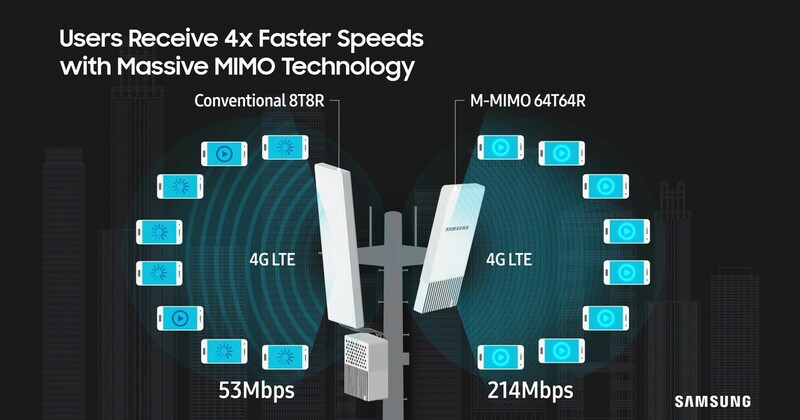 Samsung has also announced that in addition to providing significant capacity and speeds gain on the same measure of spectrum, the MIMO solution also provides support split-mode facilities, which allows Sprint to provide 4G LTE and 5G NR on the same radio. The deployment of the massive MIMO comprises the Samsung CDU 30 unit, which is an advanced facility of digital unit and software that facilitate gigabit speeds while sustaining NM-IoT and eMTC. There are other major benefits associated with the Samsung massive MIMO technology that have been translated to Sprint as a carrier. First, the commercial M-MIMO solution of Samsung functions on a 64-transmit and 64-receive configured radio, which gives an improved speed and capacity within the network. Secondly, the access unit of Samsung’s M-MIMO is integrated solutions, which feature active antennas and a radio unit in a lightweight and compact form factor. Additionally, the latest CDU 30 as well as the higher LTE software features will engender high gigabit speeds through elements such as TDD-FDD carrier-aggregation and inter-band FDD carrier-aggregation. Sprint has already begun the deployment of the 5G-ready M-MIMO technology. The implementation of the massive MIMO will entail the new Samsung CDU 30, the higher capacity digital unit and software. This will significantly boosts the speed and capacity of gigabit while sustaining the NM-IoT and eMTC.